Keeping children safe, providing for their needs, and giving them the opportunities they deserve to flourish are the hopes of parents all over the world. Mwinpog Dan-yi and her youngest child. She has doubled her farming yield thanks to participation in a sustainable livelihoods program running in northern Ghana. But mothers, in particular, face many barriers in providing for their children’s needs in communities that are affected by long-term poverty and the impacts of climate change. The impacts of climate change make agricultural livelihoods (upon which 85% of sub-Saharan Africa’s smallholder farm families rely for food and income) a precarious venture. When crops fail, families go hungry and women are often the first to sacrifice their meal to feed their children. Communities are experiencing a lengthening of “the hunger gap” – that period during the year when food runs out but crops haven’t yet come in. In many of the communities in which we work around the world, unprecedented changes in rainfall patterns have created extreme conditions that make subsistence farming – that is, growing food to feed your family – extremely difficult and growing enough to earn a sustainable income impossible. The hunger gap leaves vulnerable farm families faced with selling off valuable assets to survive until they can plant and harvest once again. Women lack equal access to resources (such as improved seeds, fertilizers and equipment), credit, training, income, and land. This results in yields that are often 20 to 30 per cent lower than their male counterparts. Women lack equal access to markets and the skills to take advantage of them. They are also often still confined to growing domestic-use crops rather than cash crops, inhibiting their income-earning potential even further. Systemic and persistent gender inequalities create barriers to development for women. In sub-Saharan Africa, women are primarily responsible for growing and preparing food and raising livestock. But it is also their responsibility to be the caretaker for children and the ill in their families, and plant, harvest and tend to their husband’s crops before their own. This creates a significant time and labour burden and traps women – and their female children – in cyclical poverty that is the result of systemic inequalities. These barriers add up to one very real fact: mothers trying to feed their children from what they can grow and sell are among the most disadvantaged and vulnerable people on the planet. But, there is hope! Within each of these very real obstacles are the seeds of change. Canadian Feed The Children is working to close the hunger gap for tens of thousands of farm women. With donor support, we are achieving significant increases in agricultural productivity, helping to create sustainable agricultural (and alternate) livelihoods, and advancing women’s equality in countries like Ghana, Uganda and in Ethiopia (which is facing one of the worst droughts in 50 years). After three failed growing seasons, millions of people have been left in need of food aid and 430,000 children are suffering from acute malnutrition. In Uganda and northern Ghana, crops are failing at similar rates. Right now in Uganda, the rains – expected in February – only started to fall in mid-April. For these countries’ smallholder farmers – many of them in female or youth-headed households – the rains are coming too late to prevent another failed growing season. In CFTC communities, women farmers who have received support have been able to double their crop yields and feed their families reliably. This is occurring even in areas most severely affected by drought. 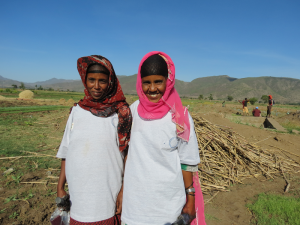 On a recent visit to Ethiopia, CFTC’s President & CFO Debra Kerby met farm families whose fields were thriving, thanks to irrigation systems that have freed them from dependency on rain-fed agriculture, and drought-resistant seeds than have enabled them to plant multiple crops per year based on market demand. In northern Ghana, woman are achieving similar success at countering the challenges that climate change is bringing. One of these women is Mwinpog Dan-yi – a farmer and 45-year-old single mother of five. Before CFTC came to her community, Mwinpog and her family had to survive from what she could grow from her small plot of land and from rearing a few pigs. She was never able to produce enough. Without a surplus from her fields to sell in the market, she could not feed her family of five and her dependent mother regularly. She could not cover the cost of school fees for her children. Her family lived in a precarious state of vulnerability. Mwinpog received agricultural training, drought-resistant seeds, and market knowledge thanks to CFTC supporters. She participated in workshops to learn more about climate change issues and she was given technical training on agricultural practices that have helped her grow more crops despite dry conditions. Mwinpog also received drought-resistant seeds and guidance on diversifying her crops. Now, she grows groundnut (traditionally, a ‘woman’s crop’) and maize (grown as a cash crop). This past season, she doubled her maize yield, which brought in more than twice the income she had earned previously. 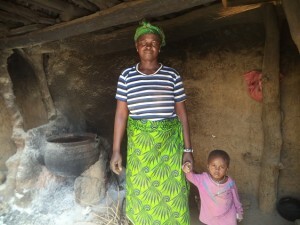 She no longer fears being unable to feed her children or send them to school. She has new skills and confidence, and a foundation to build a more prosperous future for herself and her children. 1. 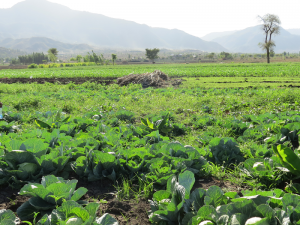 Support sustainable farming practices that build resilience to the impacts of climate change – specifically targeted to women and youth-headed households. 2. Help provide necessary resources like irrigation systems, ploughing services, drought-resistant seeds, livestock, access to credit, and training for income-generating opportunities which put valuable assets, which are otherwise unavailable to women or too expensive, directly in the hands of farming women and make farming more productive. 3. Create access to markets and the skills to take advantage of them to increase the income available from agriculture, and help support non-agriculture livelihoods to supplement income available to women. Give female farmers valuable market and business skills, and support locally-run credit and savings groups that provide not just access to credit and savings/management skills, but important social supports that empower and build women’s self-confidence. 4. Contribute and speak up for initiatives that put the power of community development in the hands of women themselves, and address the gender inequality that is one of the root causes of poverty among women and children. Mwinpog Dan-yi is one of 120,000 smallholder farmers receiving support from the Resilient and Sustainable Livelihoods Transformation Project (RESULT), funded generously by Global Affairs Canada and CFTC’s private donors.